Controlling Styrene Fume Exposure in the Manufacturing Sector - Sentry Air Systems, Inc.
Styrene is a group of substances known as the volatile organic compounds and is a critical component to a multitude of products. Styrene enables manufactured products to deliver highly sought after benefits, including strength, durability, comfort and safety. Because of these benefits, the demand for styrene continues to grow. Occupational exposure to styrene mainly occurs in the reinforced plastics and polystyrene industries. The most common exposure to styrene is through inhalation of fumes and vapor in the work place air. Styrene has been found in over 15% of 1,699 National Priorities List sites identified by the Environmental Protection Agency (EPA). This is a list of national priorities among the known releases or threatened releases of hazardous substances, pollutants, or contaminants throughout theUnited States. Just how harmful is styrene fume? During the production of styrene-based materials, hazardous styrene fume and vapor may emit and enter the operator’s breathing zone. Multiple research and regulating authorities have classified styrene as a possible, or reasonably anticipated, human carcinogen. Liquid styrene has a sweet, aromatic scent and, when inhaled over long periods of time, can affect the central nervous system and cause symptoms including depression, headache, concentration problems, fatigue, nausea and drowsiness, irritation of the eyes, nose and throat and chemical pneumonitis. Repeated exposure has been reported to cause subtle changes in hearing, balance, color vision and psychological performance. Long-term exposure to styrene may also result in the impairment of short term memory, irregular heart beat and changes in the function of the liver. The Occupational Health and Safety Administration (OSHA) has limited workers’ exposure to an average of 100 ppm for an 8-hour workday. Sentry Air Systems has both portable and benchtop source-capture solutions that can be equipped with carbon filtration to help control styrene fume and vapor. Our granulated activated carbon filters are designed for superior odor and chemical vapor containment. The porous nature of the carbon granules form an internal structure of interconnected capillary passages to adsorb the odors. 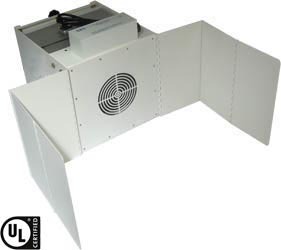 These filters work exceptionally well at reducing nuisance and potentially hazardous chemical odors such as styrene. 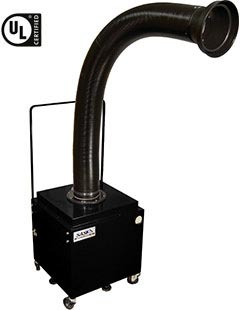 The Model 400 Portable Floor Sentry utilizes a powerful motor and fan to pull harmful air contaminants and chemical fume into the filter chamber before recirculating cleaner air back into the workspace. To learn more about styrene fume exposure and to receive a free fume extraction quote, contact Sentry Air Systems today. Call 800.799.4609, email sales@sentryair.com, visit our website or fill out the feedback form below.